It’s dark; the wind is raging; the waters are rough. And a figure looms out of the darkness, walking on the waters, approaching the boat. And understandably, they are terrified. 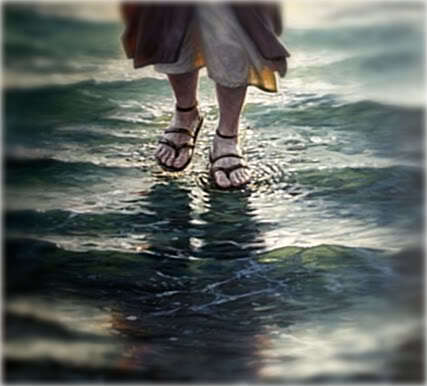 Who is he who comes walking on the waters, in the dark, when the winds rage, and the sea is rough? And that too is the aspect He sometimes wears. He appears when it is dark, and the winds are strong, and the waters rough. He walks towards us, a dark figure, and we cannot see his face, and we do not know his name, and we are terrified. But it is Him, nonetheless, and face to face with the stranger in the darkness, we are to remember God’s most consistent command: Do not be afraid. And so I will not be afraid. I shall taste the goodness of the Lord in the land of the living. The Israelites response to the manna which sustained them was “What is it?” In Hebrew, Manna. The answer was always, is always, the same. For richer or for poorer, in sickness and in health, in success or in failure, in rich friendship or loneliness. Everything we have comes from God. He comes to us in spring and summer–and in winter too. In abundance—and in scarcity too. When life is easy—and when it’s excruciatingly hard. Thanks so much for the encouragement, Steve! I shared this on my page, Anita. THANK YOU. I’ve never noticed that bit before; the apparently miraculous arrival. The detail is quite interesting and I was trying to figure out where the boat might have left from. I have long loved that detail–and have “experienced” it so often, and want to experience it more, again and again. There have been times when I have been stuck in writing, or business or in a relationship and all is dark, murky and hopeless and “I cry out to the Lord in my distress” and immediately see a way out of the business morass, or the stagnant or stuck writing, or the relationship going wrong. I don’t think Jesus will always allow our boats to immediately reach shore when we call out to him–because we do need to develop our characters–but he often does!! Thanks for your message today. Sometimes we, who are his children, still fail to recognize God’s presence in our most difficult situations. Even in our daily, common interactions, we fail to see the workings of God. My prayer is for God to open our eyes in every situation, relationship, and activity throughout the day. Indeed! Thanks Patty, and welcome to my blog!